I finished the last circle of the third round during my lunch break at work. It’s such a bright orange! I’m going to mix it up with a bit of yellow in the next round. Should help to even it out a bit. I’m thinking that in the next one I make I’ll do the different circles in different colors based on the number of rings they have. It might make it easier to keep track of if you’re trying to make the pattern yourself. Especially in the next section which is circle on circle on circle and (I think) each of different sizes. Hmmm…. Kinda looks like the start of an octopus. I’ll have to keep that idea in mind. On Thursday I left Seattle and headed back down to Los Angeles. Drove straight down (well, except for a quick side trip to Lacis, in Berkeley, CA.) and got down here early Saturday morning. Didn’t do much tatting along the way, but have done a bit since then, mostly on this tea cloth project. Finished the second round and got started on the third. 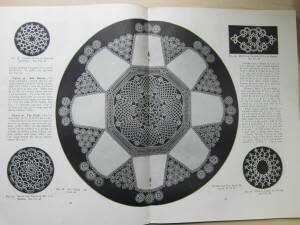 The second round is made of circles of 12 rings and chains and then the third is 16 rings and chains just like the first. In making the circles for the third round I did try making them with just 2 stitch chains, but as you can see, they really did curl up. They might straighten up when I do the fourth round, but I decided to switch back to alternating between 2 and 3 chains for the rest of them. This is not a very exciting post, I’m afraid, but soon I’ll start making another version of this in nicer thread and with a few more colors and that should make it a bit more exciting. 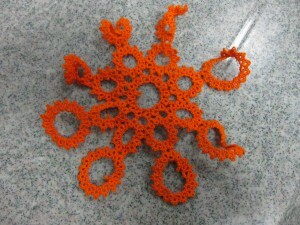 Btw, thank you to those who have offered to do a bit of test tatting for me on my Shuttle Birds handout. 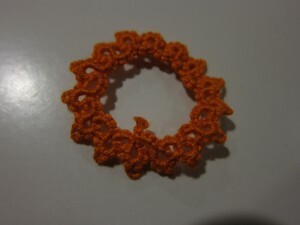 I did finish my testing of the choker pattern and have a couple changes to make to the handout. Somehow I forgot to make a note of the size of thread to use or that it should be CMT. Believe it or not, this little motif took me almost two hours to get right. Sure it was two hours in which I was slightly distracted by watching TV, but still. Two hours for this simple ring and chain circle. I’m tackling the large tea cloth in the Priscilla #2 book. It’s a gorgeous piece and one of the things that drew me to the Priscilla books in the first place. But is so often the case of the patterns in the Priscilla books, it’s taking a bit of tweaking to get right. 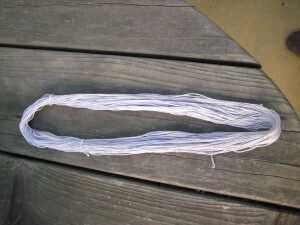 The main difference seems to be the change in the length of the joining picots. These days picots are usually shorter and most of the ones in the Priscilla books seem to be much longer. Shortening the picots shortens the outer size of the circle and made it twist back on itself the first few variations I tried. The original pattern calls for rings of 2-2-2-2 and chains of 4. I tried that and then tried rings the same and chains of 3, but even that would twist them. Chains of 2 seemed to be too far in the other direction and I didn’t want to change the stitch count on the rings at all so in the end I went with chains alternating between 2 and 3. It was a bit tricky to keep track of while tatting, but it seemed to work. ea cloth, but at the moment I’m just focusing the center part – the first 4 rounds. In the close up here, though you can see that there’s going to be a lot more of these little circular motifs so they’re going to keep me busy. Unfortunately this also means lots and lots of ends to hide. As usual, I’m doing my first run through in size 10 Royle thread and not worrying about the ends, but eventually I’ll want them to look nicer. I’ve see a partially finished version and it’s much larger than you would first expect. 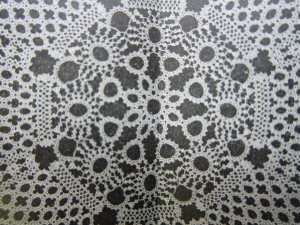 The Lace Museum in Sunnyvale has one that has the center octagon finished (up to the point that the cloth pieces start) and even in a small thread it’s quite large. I had been thinking of making it in size 80, but as I look at it again and contemplate having to sew in all those ends I’m rethinking that idea. I think I’ll still make a couple versions of the center part (the first 4 rounds) in different sizes just for the size comparison, and to see how it goes. Since I started sewing in ends (instead of using the magic thread trick) I haven’t used size 40 or 50 much so maybe once I use them a bit more I’ll find they’re not too difficult to sew in. Been working on a lot of other projects over the last couple weeks. Hope to get around to writing more about them soon. Now that the holidays are over and I’m feeling all moved and settled in Seattle I’m finding a bit more time to update here. 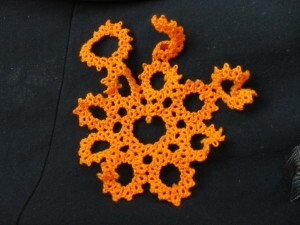 I’ve been busy with a bunch of different tatting projects though, so I’ve got a lot to get caught up on. One of the things I did before leaving San Diego was to try dyeing thread with pomegranates. I had about six that I was cutting up to get the seeds out and I use the method of putting them into water to keep them from squirting juice everywhere. To dye the thread I just threw the skein in with the pomegranates and let it soak while I work on separating the seeds. Every now and again I took the thread out and rolled it around on the cutting board some whenever there was a little pool of juice from cutting. I was actually going for a more spotted look and this seem to be working. I had a beautiful dark pink-red and was pretty excited about it until I finished seeding the pomegranates and rinsed out the thread. I was totally surprised with what I ended up with. It’s sort of a light gray-ish, blue-ish pink. Not a bad color, just not at allwhat I was expecting. I was a bit disappointed because the color that it has started with before I went to wash it is one of my favorite colors, but I’ve wound this one up on a little spool and have added it to my bag of experiments. 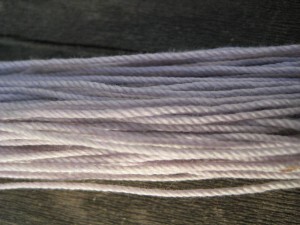 I’ve started winding up 50 yard, ready-to-dye skeins and am keeping them handy whenever I feel like dyeing some. I wound a couple before I left San Diego and still have those 9-10 more to go, so lots of dyeing in my future. Right now as far as dye goes I only have that blue that I used before and a yellow, but I look forward to trying out some other new colors. Eventually maybe I’ll actually figure out how to do a nice pomegranate color.